Once a secret spot for local kids, the Maasin River palm tree swing in Siargao is quickly becoming a hot tourist destination thanks to the likes of Instagram. On an island of millions of palm trees, this one palm tree recently became famous due to its bent angle and positioning directly over a stunning turquoise river. The swing was built and is still run by local children, who won’t hesitate to show off their backflipping skills or laugh at you if you face plant on the water. If you're in Siargao, visit this local spot before it gets too popular and crowded with tourists! You’ll most likely pass this swing without even trying since it's located between the tourist hub of General Luna and the most popular site on the island, Magpupungko Rock Pools. 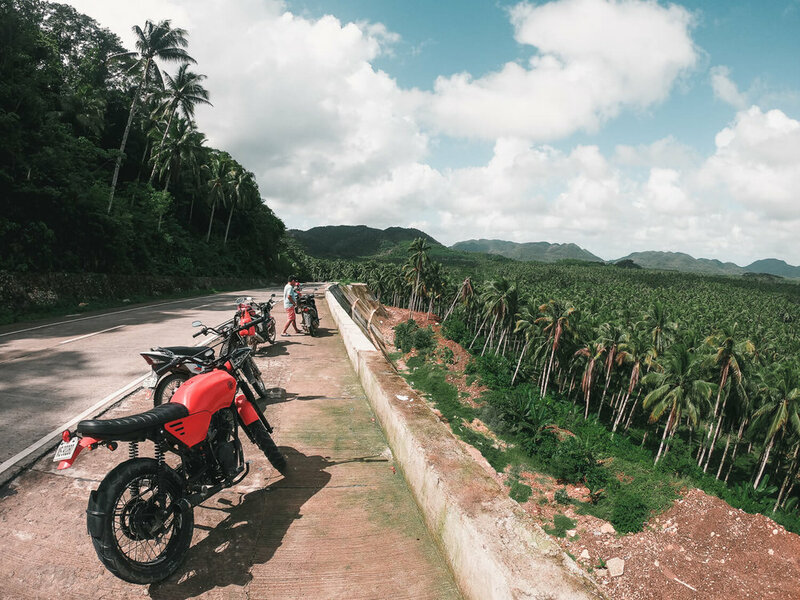 While driving on Siargao Circumferential Road from General Luna, you’ll pass an amazing palm tree forest viewpoint and some epic palm tree roads before you finally hit a bright red bridge. When you see this bridge, stop and park your scooter (or hop off your tuk-tuk). You'll be able to see the palm tree sticking out over the water from the bridge. At this point, a local will probably come to meet you and lead you to a booth by the river bank where you'll pay a small entry fee and get matched with a local guide. The entry fee is 20 PHP per person, but since you're given guides, it's expected to tip them on top of that. We tipped our guides 100 PHP but honestly have no idea what's considered reasonable. You can also rent a boat for 150 PHP/hour and take it out on the river underneath the swing. The location of this swing wasn’t yet on Google Maps when we first visited so we ended up missing the red bridge entirely. After backtracking a few more times we finally found it. It was the middle of the day, but to our surprise, there were no other tourists there. After paying the entry fee, we were matched with two guides. This seemed excessive, since the walk is only 5 minutes and on flat ground, but they were both cool so it was ok.
A few minutes later we arrived at the swing itself. Perched on top of the tree, was one kid holding the rope for the swing. One by one, more kids would climb up the palm tree, grab the rope, and swing into the river. The kids were showing off their backflips, double backflips, and even triple backflips. Some of the older guides also attempted the swing but those mostly ended with hilarious crash landings into the water. It really felt like a secret local playground, and we felt a little bad for intruding on their fun. But the kids were so excited and encouraged us to try the swing over and over. A few dozen Tarzan swings later, we bid them farewell. If you've always wanted to learn to drive a scooter, Siargao is a great place to learn. The roads are nicely paved with wide lanes and you'll often be the only vehicle on the road. That being said, there are often parts of the road under construction, so drive slowly so they don't take you by surprise. Another thing to keep in mind is that the hospitals are incredibly unequipped to handle injuries! We got into a small accident while we were on the island and were told that the nearest tetanus shot is an hour plane ride away. Looking for travel insurance? - We always travel with World Nomads to cover ourselves and our belongings. The rates for renting a scooter are generally 500 PHP for one day, 400 PHP/day for two days, and 350 PHP/day for more than two days. Alternatively, you can rent a tricycle and driver for the day for around 2000 PHP. These 3-wheeled carts are attached to a scooter or motorbike and can fit up to 5 people uncomfortably. Kermit Siargao - This is by far the most recommended place to stay in Siargao. Unfortunately, they are often fully booked far in advance. They have semi-working wifi (which is almost impossible to find in Siargao), a delicious restaurant, and some of the best tours and surf lessons on the island. Point 303 - This is where we stayed! They have some very cheap private fan rooms for those on a budget. They also had two adorable 4 month old puppies who would come hang out in our room. Soul Tribe Beach Retreat - This is one of the most hipster glamping accomodations we've ever seen. Their tents are located right on a white sand beach, surrounded by beautiful palm trees. If you've ever wanted to try glamping, this is the place to "embrace your inner gypsy" as they say on their site. Sandy Feet Siargao ($$$) - Luxurious beachfront villas. Good for families and groups of 3 or 4. If you’re planning a trip to Siargao, check out our full guide on the island including a sample itinerary and budget. We hope you enjoyed this article, and if you have any questions about this spot, let us know in the comments below!